Quick Summary: Students will be immersed in and connect with the documentary film Chasing Asylum. They will engage with the film from critical, emotional, cultural and ethical perspectives and understand some of the background of the film while also considering the intentions of the filmmaker. Students will understand how to actively view documentary films. Students will consider the importance of context and background when critically considering a documentary film. Students will engage with the Chasing Asylum documentary as the filmmaker intended. Relevant parts of Year 10 English achievement standards: Students evaluate how text structures can be used in innovative ways by different authors. They explain how the choice of language features, images and vocabulary contributes to the development of individual style. They develop and justify their own interpretations of texts. They evaluate other interpretations, analysing the evidence used to support them. They listen for ways features within texts can be manipulated to achieve particular effects. Level of teacher scaffolding: Low – set up AV equipment, set film context and supervise student viewing of film. Resources required: Student Worksheet – one copy per student OR computers/tablets to access the online worksheet. Device capable of audio/visual presentation to present a film to the class, projector and speakers. (A purpose-specific viewing room would be ideal.) You will need to access the Chasing Asylum film by streaming it from Kanopy or purchasing the DVD at the ATOM Education Shop. Other factsheets: Chasing Asylum – Film Synopsis, Documentary Viewing – Factsheet, Things to address before viewing and studying Chasing Asylum. Keywords: documentary, asylum seeking, refugee, migrant, immigrant, emigrant, persecution, sovereignty, nation-state, citizenship, statelessness, whistleblower, policy. Overarching learning goal: Students will become active viewers of a documentary film in order to consider its content and critically assess the intention of the filmmaker. 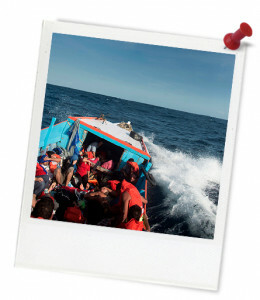 Teacher content information: The issue of people seeking asylum and border protection is very political - many different perspectives exist across a range of contemporary and historical media texts. Australia has a long history of migration resulting in diverse ethnicities, cultures and religions. The movement of people has occurred for varied reasons, including work and employment opportunities, family connections, and leaving due to the effects of war or conflict and persecution. Thought Starter: Many documentary filmmakers attempt to change or improve society in some way with their documentaries. What do you THINK you know about the film/topic? What PUZZLEMENTS do you have about the film/topic? What aspects of the film/topic would you like to EXPLORE?